CEBU, Philippines — Leading by example is a belief that newly crowned Mrs. Universe 2018 Julia Gershun firmly stands for. 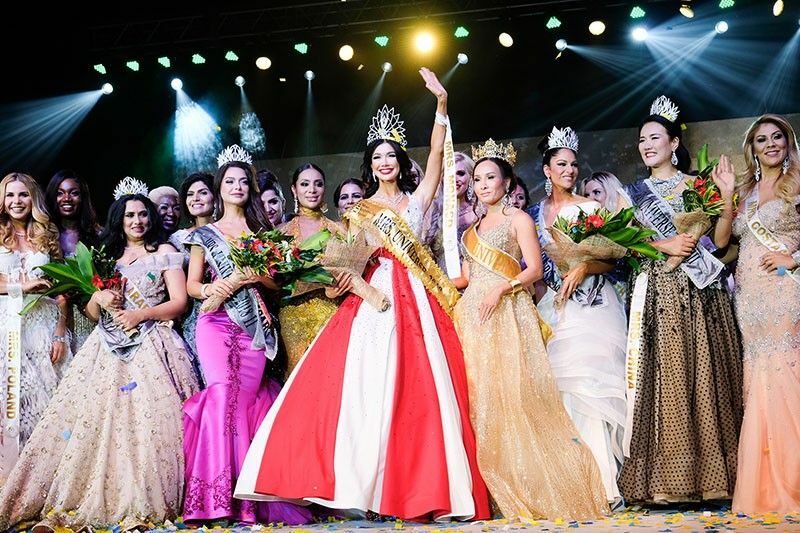 Besting 74 other candidates from all over the world, the representative of Monaco was ultimately crowned victor during the coronation night held Monday at the Pacific Grand Ballroom of Waterfront Cebu City Hotel and Casino. The 28-year-old TV presenter, professional model and host is full of gratitude for winning the Mrs. Universe crown, something that she considers a childhood dream. “A very big thank you [to Mrs. Universe] for the opportunity to be a better person, good mother and good wife,” Gershun says in an interview after the coronation. Having won titles like Miss International 2012 in Japan, Miss Dnipropetrovsk 2012, Miss Donbass Open 2013, Princess of Ukraine 2015, Miss Ukraine Universe 2016 first runner-up, and Top Model of the World 2017, Gershun is an experienced beauty queen and supermodel of sorts. She earned her Faculty of Physics and Mathematics degree at the Ukrainian University of Taras Shevchenko and has a diploma from the Kyiv Institute of International Relations. “Mrs. Universe is my biggest childhood dream. I prepared for one year… [I feel an] unbelievable emotion. I really don’t believe that it happened. Maybe tomorrow, I still will not believe it,” Gershun chuckled. She said it helped that she’s been dancing since she was a child, which has kept her fit apart from regular workouts and careful diets. Aside from ballet, Gershun is a chess, gymnastics, tennis and golf enthusiast. She also keeps busy as the founder and president of a charitable foundation called Talented Children Evolution. It is her wish for children to realize their dreams just as she had. Since the Mrs. Universe competition format does not include a question and answer segment but instead focuses on a forum where candidates deliver a presentation on their advocacy, Gershun stressed the topic of being an example to children. “It’s a very important, serious program against domestic violence. We have many charity and social projects. I hope my new job, my new title will help me give more kindness, tenderness and love in the world,” says Gershun. She suggests that if children are not exposed to domestic violence, they will be less likely to practice it. Making up the rest of the Mrs. Universe 2018 court are Nicole Zwiercan from the United States of America as first runner-up, Nadezda Chevlytko of Chita as second runner-up, Junching Liu of China as third runner-up, and Khushboo Karva of Arab Asia as fourth runner-up. Philippine bet Beau Singson ended her Mrs. Universe 2018 journey as part of the Top 25 candidates alongside delegates from Vietnam, Brazil, Australia, India, UK, Korea, Siberia, Ecuador, Peru, Botswana, New Zealand, Poland, England, Lithuania, Nigeria, Russia, Singapore, Trinidad and Tobago, Costa Rica and South Central Asia. The Top 25 candidates were judged according to their national costume and evening gown appearances, as well as their advocacies and performance during the Mrs. Universe 2018 forum held Dec. 6 at Bai Hotel where they presented solutions to problems and issues they would like to address. From the 25, only five were chosen through beauty of face and physique, and their advocacy on the coronation night. Mrs. Universe Ltd. searches for the most honorable married woman and between 25 to 45 years old. The competition and organization continues to highlight the role of a woman in the home and the community, with a mature, accomplished woman leading the way.